Buying a Grand Waikikian by Hilton Grand Vacations Club is easy with the timeshare experts at BuyaTimeshare.com. We have created a resource for vacationers to find the perfect HGVC timeshare they are looking for. Buy or even rent and always save thousands of dollars off the regular retail price. The Grand Waikikian astounds guests with six swimming pools and suites that are adorned with a view of Duke Kahanamoku salt water lagoon. An oceanfront hotel, Hilton Grand Vacations Club delivers world-class services and amenities. For buyers that are looking to get the most for their money, BuyaTimeshare.com has made buying a vacation property in Hawaii fast and easy. Each private condo is designed to accommodate the entire family. With enough room to relax and plenty of extras, the delightful weather is not the only attraction. 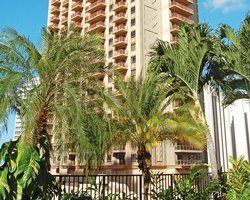 In addition to the amenities and services, the Grand Waikikian by Hilton Grand Vacations Club features a festive tropical getaway with exotic wildlife and botanical gardens around every turn. On-site restaurants are ideal for a romantic night out and traditional specialties are available in more than twenty different restaurants within close proximity to your unit. Take a leisurely, scenic walk home and return to the comfort of your own Hilton suite in Hawaii. Buying a timeshare in Hawaii takes very little time at all with the innovative features of the online resale market. Browse from home and find the resort that you want by using the advanced search features on our website to find the timeshare that is just right for you. Specify the price and the week; you can even choose the view! This majestic resort is set along Waikiki Beach, so do you want a suite that overlooks a lush garden or the sea? The choice is up to you! The Grand Waikikian offers absolutely everything you could want in a timeshare by Hilton Grand Vacations Club. Everyone that buys a timeshare at the Grand Waikikian is able to enjoy a prepaid vacation in Honolulu every year and the timeshare resales market is known globally for its convenience and affordability. Take advantage of this opportunity to feel the sand between your toes as you stroll along the beach, just outside of your own luxury suite. The Grand Waikikian concierge service is friendly and can arrange hula lessons for the whole family, a luau and pig roast. Show tickets, reservations, or a walk up to the peak of Diamond Head volcano is just a phone call away. Buy any one- or two-bedroom suite for a tropical paradise to call home every year. Timeshare resales go quickly on the islands and when one is up for grabs, act quickly before the opportunity passes you by. 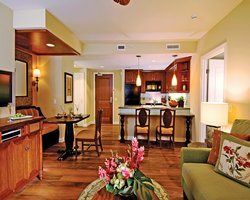 To take advantage of all the benefits of a tropical island paradise in Waikiki, buy a timeshare at the Grand Waikikian by Hilton Grand Vacations Club. The ultimate in premier amenities, owners can enjoy a spa treatment to revitalize the spirit after a day of shopping, take a tour of the surrounding towns or experience the always-exciting nightlife. Hawaii is the ultimate destination spot of world travelers and any timeshare owner is delighted to be a part of the island culture. There is no place on earth like Hawaii, with the friendliest people, perfect weather, tons of activities and adventures - ideal for the entire family. Contact Hilton Grand Vacations Club at Grand Waikikian Specialist Today!